Transparency Market Research, in its latest report, forecasts that by 2020, the highest demand for penoxsulam will come from the Asia Pacific region - a region where agrarian economies will see increased consumption of the herbicide. 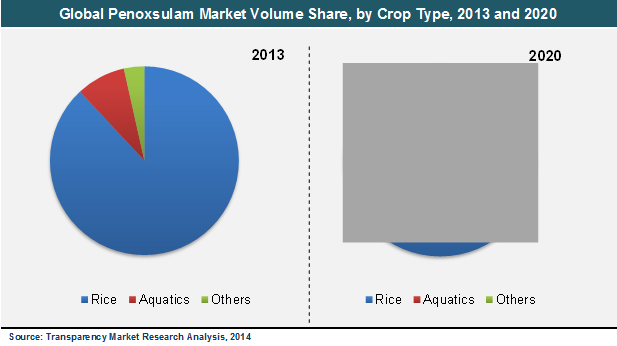 In 2013 as well, the Asia Pacific region stood as the foremost demand generator in the global penoxsulam market, creating about 55% of the global demand for the herbicide. The report, titled ‘Penoxsulam Market - Global Industry Analysis, Size, Share, Growth, Trends and Forecast, 2014 - 2020’, states that leading crop producers such as China, Bangladesh, India, Vietnam, Thailand and Indonesia will consume large amounts of penoxsulam. According to the website of the Statistics Division of the Food and Agriculture Organization of the United Nations, in 2013, Asia accounted for about 90.6% of the total amount of rice and paddy produced globally. The rice cultivation sector creates the highest demand (85%) for penoxsulam as compared to other types of crops globally. The findings of the report state that the Rest of the World (RoW) region comes second only to the market leader - Asia Pacific - in terms of demand. Analysts who created the report expect that the RoW region will report a significant rate of growth as far as the consumption of penoxsulam goes. The report further notes that North America is the smallest market, because the amount of rice grown in the region is insignificant as compared to the market leaders. Thus, the North America penoxsulam market will put up a lackluster performance through the current decade.Europe, on the other hand, will experience an expansion of the penoxsulam market, but not at a very remarkable rate. Rice is grown in a few European countries that experience temperate climate, but the availability of several other herbicides will likely eat into the market share of penoxsulam in Europe. Some of the other herbicides that compete with penoxsulam are acetochlor, butachlor, and clomazone; but penoxsulam remains the most widely used herbicide for weed control. Desirable attributes of penoxsulam-such as its mobility when used in both terrestrial and aqueous environments and its ability to prevent weed growth without harming fauna and animals-will encourage farmers to use this herbicide. This will impel growth in the penoxsulam market over the forecast period of this report.But one aspect that could potentially disrupt the global penoxsulam market is the expiry of Dow AgroSciences LLC’s patent on the herbicide somewhere around 2017. This will encourage many new entrants in the market, creating an interesting competitive mix over the next year or two. Besides profiling the company that launched penoxsulam in 2005 (Dow AgroSciences LLC), this report also profiles other strong contenders in the penoxsulam market, such as Hangzhou Tianlong Biotechnology Co., Ltd. and Shijiazhuang Xingbai Bioengineering Co., Ltd.The study offers a comprehensive analysis of the market in terms of both revenue and volume, and offers market estimates for the period between 2015 and 2020.